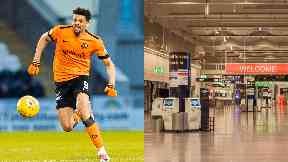 Dundee United striker Osman Sow was held by police over alleged money laundering after carrying £15,000 cash through a Swedish airport. The 28-year-old was stopped by police at Stockholm's Arlanda Airport on Saturday. Officers seized the money which Sow, who was with another man, tried to take through security. A police spokesman said an investigation has been launched into how Sow obtained the cash. "After being interrogated, they were both released. The money was seized. "They are both accused of fraud and/or money laundering. "The investigation is ongoing, where the most important question to determine is where the money comes from." Sow is expected to feature in the Dundee United squad to face Ayr on Friday. The club refused to comment on the allegations.